Widely regarded as a modern populist classic, the film is both a fabulist fable and a celebratory baseball movie that acknowledges scandal within the sport but also the game's transcendent ability to rise above attempts to damage its integrity. 107 min. Universal Pictures. Director: Phil Alden Robinson. Cast: Kevin Costner, Amy Madigan, Gaby Hoffmann, Ray Liotta, Timothy Busfield. Do you believe in magic? That's the (non)musical question posed by Field of Dreams, adapted by writer-director Phil Alden Robinson from W.P. Kinsella's novel Shoeless Joe. Widely regarded as a modern populist classic, the film is both a fabulist fable and a celebratory baseball movie that acknowledges scandal within the sport but also the game's transcendent ability to rise above attempts to damage its integrity. That theory has been tested more than ever in the steroid decades of the game, but Field of Dreams still retains its innocence and power to captivate. The film's throwback feel begins with the casting of Kevin Costner, a star oft compared to Gary Cooper. Costner plays Ray Kinsella, an Iowan farmer who, like his wife Annie (Amy Madigan, in a wonderfully loose performance), is a settled ex-hippie with a kid and financial responsibilities. The farm is struggling when, one day, Ray hears a voice whispering in the corn field: "If you build it, he will come." Unable to shake the voice and, soon enough, waking visions and intrusions into his dreams, Ray comes to accept that he's being asked to cut a baseball diamond into his corn field. The town collectively scoffs at Ray's madness in literally betting the farm, and even Ray admits, "I have just created something totally illogical." But someone does come to play on Ray's field: the ghost of Shoeless Joe Jackson of the disgraced 1919 White Sox. Shortly, other dead players show up for a chance to play under the lights again. The fable rests on what are essentially Biblical ideas: faith under pressure, forgiveness, and redemption. Only those pure of heart, can see the ghosts, and at first the true believers number only Ray, Annie, and their loyal daughter Karin (Gaby Hoffman). But the voice, not done talking to Ray leads him to Terence Mann (James Earl Jones), a pastiche of J.D. Salinger and Ken Kesey. A counter-cultural novelist who broke through in the '60s with his novel "The Boat Rocker" (and is credited with coining the phrase "make love not war"), Mann now lives as a recluse writing software for children's programs. Under his gruff exterior, though, he's a baseball-loving softie, and Ray entices him to recognize the magic at work (in another context, Mann also provides a nifty opportunity for Annie to shout down loudmouth parents challenging books in hopes of a ban). The mysterious messages Ray receives lead the duo to Archibald "Moonlight" Graham (played at different ages by Burt Lancaster and Frank Whaley), who played but half an inning in the majors without ever getting to bat. If one can entirely suspend disbelief, there's definitely something charming about this consistently impossible story, which centers around not only following dreams despite their impracticality, but also doling out second chances. Robinson's crisp opening narration immediately flags father issues. Ray later admits, "I'm scared to death I'm turning into my father...I never forgave him for getting old." Dad once played in the minors, long before the rift between father and son and the father's untimely death. One way or another, it's certain the ballfield and its ghosts will lead to a resolution of Ray's unresolved issues. The story suggests that the ultimate dream can be what's right in front of you, namely family. The cast is uniformly excellent, James Horner's score is a winner, and Robinson cultivates humor and plain-spoken poetry that contributes to the film's simple, understated quality. It's the ultimate in feel-good movies, with plenty of memorable moments: particularly the zen laugh of Jones' exit and the final one-two punch of imagery. Universal does a fine job of transferring Field of Dreams into the next-gen format of Blu-ray. The film's image has always been problematic in other formats, looking a bit dim and diffuse. The Blu-ray offers the best image yet: though there's a hint of vertical bounce to the image, the picture is otherwise clean and offers more detail than ever, with impressive colors and shadow detail. 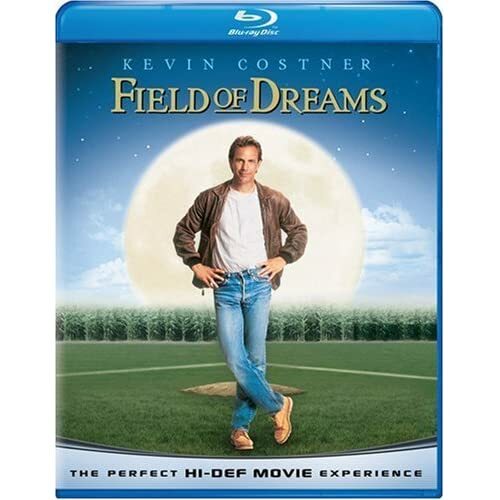 Field of Dreams isn't a title with a lot of aural immersion, but the clean lossless DTS-HD MA 5.1 mix can be considered definitive nonetheless. Speaking of definitive, this disc happily retains all previously available DVD bonus features, beginning with a feature commentary with director Phil Alden Robinson and director of photography John Lindley and an interesting selection of "Deleted Scenes with Introductions by Phil Alden Robinson" (16:50, SD). "From Father to Son: Passing Along the Pastime" (38:41) is a making-of flavored with comments by major leaguers. Participants include Barry Zito of the Oakland As, Chicago Cubs manager Dusty Baker, Anaheim Angels manager Mike Scioscia, Robinson, producers Lawrence Gordon and Charles Gordon, James Earl Jones, Timothy Busfield, Amy Madigan, Ray Liotta, Frank Whaley, Tom Verducci of Sports Illustrated, Anaheim Angels coach Mickey Hatcher, Ben Sheets and Chris Capuano of the Milwaukee Brewers, Dwier Brown, and Chicago Cubs coach Jeff Huson. "Roundtable with Kevin Costner, Bret Saberhagen, George Brett and Johnny Bench" (29:56, SD) is an unusually mesmerizing extra, with Costner inviting three basball legends to his home to view and discuss Field of Dreams, as well as their lives in baseball and their families. Costner's proclamations get a bit flowery, but the featurette is never less than fascinating. Including a few words from Robinson, "A Diamond in the Husks" (17:41, SD) mostly talks with the residents of Dyersville, Iowa about the film's making and its subsequent impact on tourism. In "Galena, IL Pinch Hits for Chisholm, MN" (5:35, SD), Galena historian Steve Repp gives us a smalltown tour. Thankfully restored from the 1998 DVD (after skipping the 2004 "Anniversary Edition" DVD) is "Field of Dreams: A Scrapbook" (1:29:51, SD), a feature-length making-of with Robinson, author W.P. Kinsella, Larry Gordon, Costner, Madigan, Burt Lancaster, head baseball coach Rod Dedeaux, production designer Dennis Gassner, Jones, Busfield, Liotta, composer James Horner, "Field of Dreams" property owners Rita & Al Ameskamp. It's a fantastic piece, and would have been (and has been) sorely missed had it not been included. "Bravo Special: From Page to Screen" (46:06, SD), hosted by Peter Gallagher, explores Robinson's screenplay adaptation of Kinsella's novel, with comments from Costner, Jones, Robinson, book editor Larry Kessenich, Kinsella, Universal Studios chairman Tom Pollock, cinematographer John Lindley, Larry and Chuck Gordon, Madigan and Busfield. Last up are the "Theatrical Trailer" (2:24, SD) and Universal's customary My Scenes feature and BD-Live accessibility. Even for DVD owners of the film, this definitive special edition is not to be ignored. All site content © 2000-2019 Peter Canavese. Page generated at 04/17/2019 09:58:21PM.